Noor is a boutique event space situated in historic downtown Pasadena. Our mission is to earn the trust of our Clients by producing consistent and flawless events. Readers of Pasadena Weekly have affirmed our dedication to this mission by voting Noor “Best of Pasadena” 7 years in a row (2010-2017). 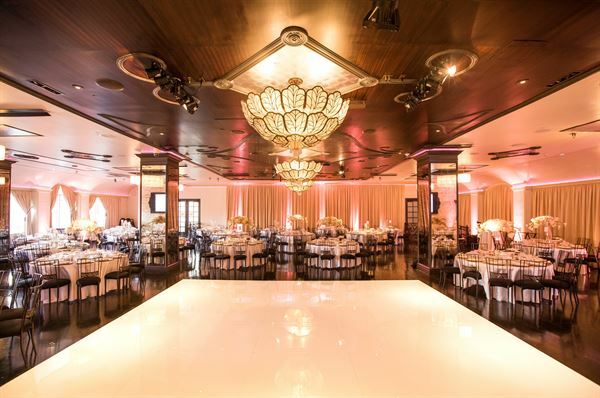 Noor features two gorgeous indoor ballrooms along with a stunning outdoor space. The Sofia Ballroom, with an art nouveau inspired ballroom design and 1920’s inspired foyer, provides an exquisite space for up to 330 guests for seated banquets. The Ella Ballroom, with its art deco design, imparts an atmosphere of elegance for up to 130 guests. The urban charm of the outdoor Noor | Terrace offers an ideal setting for extravagant cocktail receptions and illuminating wedding ceremonies. From intimate to extravagant, traditional to the unexpected, Noor is committed to designing a personalized event that is uniquely yours. Conveniently located in the heart of Pasadena and just 9 miles from downtown Los Angeles, make Noor the place for your next event. Noor provides wedding packages to meet every budget with prices starting at just $72 per person. All of the prices our wedding packages already include ballroom rental, service fee, sales tax, tableware, tables, chairs and staff. Our packages include a Formal Welcome Reception with a 1 hour hosted wine bar, butler-passed hors d'oeuvre and choice of plated or buffet service. We also offer optional hosted bar packages, Signature Mixology Drinks, outdoor Wedding Ceremony, Bridal Suite, Audio/Visual, Lighting, Valet, Photo Booth, Day-Of event Coordinator, Cigar Rolling Service, Dessert Stations. Events must meet Guaranteed Minimum. Check with your Sales Manager for further information. Dinner reception packages include a formal Welcome Reception with a 1 hour hosted soft drink bar, butler-passed hors d'oeuvre and choice of plated or buffet service. We also offer DJ Services, Audio/Visual, Lighting, Valet, Photo Booth, Day-Of Event Coordination, and Dessert Stations. Our dinner reception packages include a formal Welcome Reception with a 1 hour hosted wine bar, butler-passed hors d'oeuvre and choice of plated or buffet service. We also offer optional hosted bar packages, Signature Mixology Drinks, outdoor space for Silent Auction/Cocktails, Audio/Visual, Lighting, Valet, Photo Booth, Day-Of event Coordinator, Cigar Rolling Service, and Dessert Stations. Our High School dinner reception packages include a formal Welcome Reception with a 1 hour hosted soft drink bar, butler-passed hors d'oeuvre and choice of plated or buffet service. We also offer DJ Services, Audio/Visual, Lighting, Valet, Photo Booth, Day-Of Event Coordination, and Dessert Stations. When the doors of our Ella Ballroom open, your guests are received by our art deco inspired ballroom whose exquisite design space holds up to 134 guests for seated banquets. One (1) HD projectors with drop down projection screen (60”w x114”h) can greet your guests and be used for presentations or during toasts. Ella Ballroom features LED accent lighting, LED perimeter uplighting and a spotlight for Gobo plate. Ella Ballroom is the perfect space for intimate events. Lavish doors welcome you at Noor Ella’s entrance. Once you step inside Ella’s Foyer our gorgeous bar greets you with a breath-taking crystal chandelier. One High Definition LCD screen (27?h x 47?w) can display your seating chart and then once your guests have seated rotating pictures can be displayed throughout your event. Your guests will not miss our ornate walls with built in elegant lighting. Multiple overhead speakers can play your custom music playlists in our Ella Foyer and your guests will enjoy all the built in couches and extra seating available to them. Step outside onto your private patio and enjoy the tranquil sounds of the nearby fountain. High boy tables and chairs are setup so your guests can enjoy the outdoors while enjoying one of our delicious drinks and butlered served hors d’oeuvres. Should it get a little cool outside; don’t worry as Noor has two free standing heaters, so your guests can enjoy your private patio all night long. Step outside onto your private balcony and enjoy the view of the San Gabriel Mountains and picturesque City Hall. Giant couches, coffee tables and ample seating is available for your guests. Our Balcony also showcases two (2) High Definition LCD screens (27?h x 47?w) and has multiple overhead speakers that play your custom music playlists. Should it get a little cool outside; don’t worry as Noor has two 6,000 volt heaters built into the ceiling and two free standing heaters. Your guests can enjoy your private balcony all night long. The Sofia Ballroom, with an art nouveau inspired ballroom design and 1920’s inspired foyer, provides an exquisite space for up to 350 guests for seated banquets. Heads will turn and eyes will widen when guests step into the Sofia Ballroom’s lavish 1920s-inspired foyer. The long, burnished wood bar, high ceilings, and magnificent chandeliers will transport them to a world of glamour and gaiety. From here, your party can flow to the Sofia Ballroom, with its Art Nouveau styling and city and mountain views or onto the Sofia Balcony, a sophisticated al fresco lounge where you can practically reach out and touch the city skyline. Noor | Terrace is an ideal setting for wedding ceremonies seating up to 300, dining for up to 180 guests and cocktail parties for up to 300 guests. Celebrate your event under the stars in our Noor | Terrace courtyard and let the ambiance of the night sky and gorgeous courtyard setting enhance your reception.